Go Wild has been around for more than six years. The site got their licence from Malta in 2008, and have been operating under their jurisdiction ever since. All the mobile and online casino games at Go Wild are powered by Microgaming. This gives credibility and quality to Go Wild Casino, given Microgaming’s standing in the online casino world. 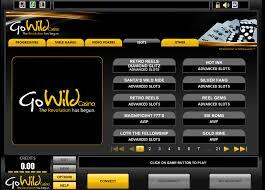 Aside from great bonus offers and incredible progressive jackpots, Go Wild also offers users stability and security. Their payout rates, certified by eCOGRA, are above 98%. The site also operates with 128-bit encryption at all times. 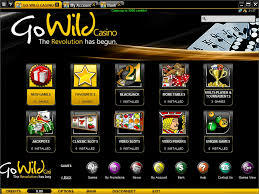 Go Wild casino offers new users the chance to get up to CA$ 1,000 in free money. This money can be used on any table games, slots or progressive slots games. In addition to the welcome bonus, players get up to 50 free spins on a slots game of the casino’s choosing. This month’s game of choice is Immortal Romance. Players who qualify for the silver, gold or platinum rewards classes will be entitled to huge bonuses every time they play a game. It takes 50,000 bonus points to join the gold class, which is the equivalent of betting 50,000 euros on slots games. Canadian users will be happy to know that they can use debit cards, Skrill, Neteller, PaySafeCard, and electronic bank transfers to withdraw and deposit money at this casino. Each of these methods allows the transaction to happen in CA$, which helps save money on transaction and currency changing fees. 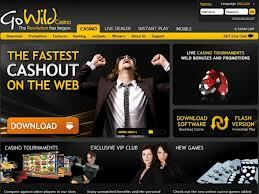 There are tons of incentives for choosing Go Wild as your online casino. The site has over 500 different games, along with progressive slots games that offer up to CA$ 5 million in jackpot prizes. A Game of Thrones slots game is available at Go Wild, with screens and pictures making up different characters and kingdoms of Westeros. Aside from slots, players also enjoy traditional games such as baccarat, video poker, Texas Hold’em and blackjack at Go Wild Casino.